Great post! Not only did you capture our time at Google, but you gave us so many ways to view the information. I love the creativity! It was great to meet you at the Googleplex and I hope we can stay in touch. 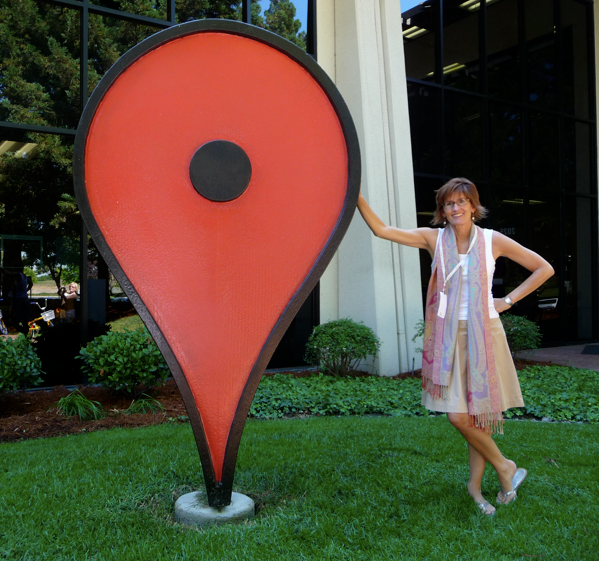 Thanks for sharing the posting, video, and slideshow about your great experience at Google. Last year, I used Google Earth to show my students the setting in the Ozark Mountains for Where the Red Fern Grows and the distance to Tennessee where Billy's dogs came from. I intended to also do a Google Lit Trip with my students, but didn't have time. I am putting that on my goals list for this coming year to have them create a Google Lit Trip for a favorite book! I love your photos of bikes at Google. What fun it would be to work some place where you could ride around on a bike! It was great to meet you and I'm looking forward to staying in touch! Thanks for your kind words! The Google Geo Institute was fantastic! Lots of information to digest over a short period of time. I think it's great that you have already used Google Earth in your classroom. (I'm not surprised!) I bet the kids loved seeing the Ozark Mountains for Where the Red Fern Grows and the distance to Tennessee where Billy's dogs came from. Visualizing the setting is so important. Have you seen Jerome Burg's GoogleLitTrips? He has several organized by grade level. The site is a great starting point. Oh...the Google bikes! They were everywhere! It was a great way to travel. Hope you are having a restful summer! wow what a wonderful opportunity to go to Goggle. I bet you learned a lot of new information which you will use. I just loved the whole slide show of Goggles grounds and how about those wonderful sculptures. I have to admit I really liked the one with you in the doughnut and Jacquce Coustean. I remember watching his amazing advertures on TV.How celevr is Mr Google using his theme of colour around the grounds (blue,red,green,yellow) and it did`nt stop even right down to his birthday cake and cupcakes. I really also like the whole concept of the giant map. I feel when can look at map at that level you do really do get a much better feel of the world and different countries.I would say more hands and feet on approach. How are things in Australia? I cannot believe I have been off from school since middle of June! Summer is flying! Yes, it was a fantastic experience to be at Google headquarters. Not only are the grounds beautiful, but the way the whole place is run is pretty spectacular. For example, all the food is free! There are 20 restaurants all over the complex so you can eat what you'd like! I agree with you about the giant maps and the impact they can have. Walking on the map and seeing the different countries and cities...it really brings geography to life for kids. AND, then to follow up lessons using Google Earth! Wow! Have you used Google Earth before? It's pretty amazing! Looks like you had a awesome time at Google. I have a couple of questions for you. My first question is what did you enjoy the most at Google? What was your favourite sculpture? What new technical computer things did you learn? I l♥ve the Google grounds. My favourite sculpture is the T-Rex it looked so real. Things are okay down under except for the flu and cold. Your holidays are flying past but your doing a lot of wonderful things while you have been on hoildays. I have never Google earth but I know Bianca has and she really, really enjoys Google earth. Bianca and I will probably download it today.Can`t wait for you to put new posts on your blog. I did have an awesome time at Google! Not only did I learn a lot, it was a fun place to be! My favorite part about being at Google was being around such hard-working, friendly people. Everyone does their best at Google, but every person we met was willing to answer questions or help the teachers out. I learned many new technical computer skills, although I would say learning to navigate around on Google Earth was very interesting for me. I'm glad you liked my picture in the donut! What an amazing post and slideshow! Thank you for sharing! 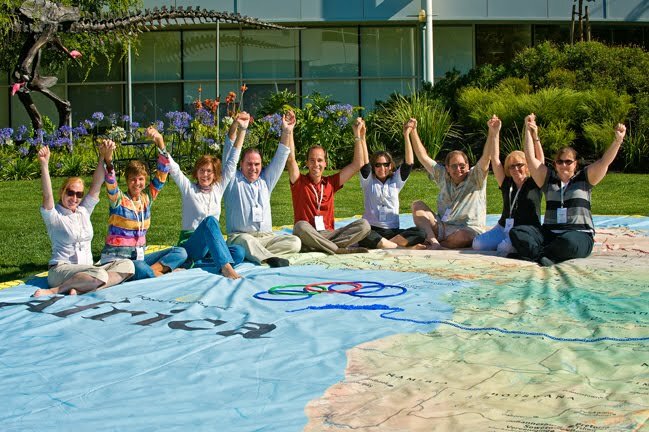 I had an absolutely wonderful time getting to know you and the other teachers at the Institute and look forward to our continued connections through the giant traveling maps. I will share my photos as soon as I get them posted -- gearing up for our GeoTech Workshop coming up in a few weeks. 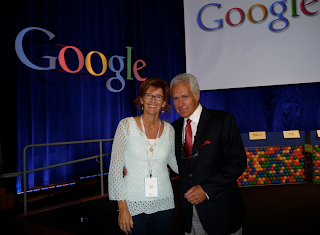 Can't wait to share all that I learned at google - especially some of the things John and Katie put together! Thanks for the compliment! 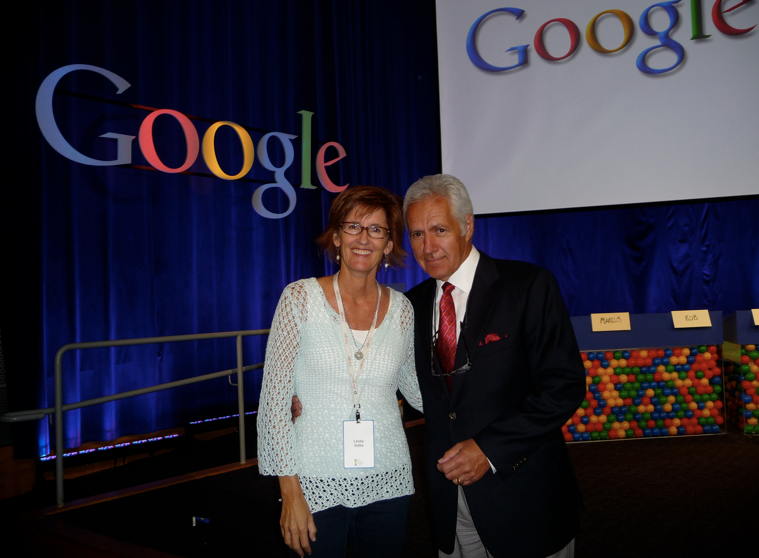 I had such a fun time being with you and all the other educators at Google! What a fantastic group of dedicated people! I am looking forward to sharing with my students too! The Google products bring so many learning opportunities to the classroom. Good luck with your GeoTech Workshop, and we'll be in touch! When I told the students in 2KM that you actually went to Google they could not believe it! Today we read your fantastic post together and we learnt a lot. We looked up Google maps to see what that red marker point you were standing next to in the photo was all about. We even found your school on Google maps! The students were fascinated to see a dinosaur on the grounds as we are studying dinosaurs this term and it is a topic that many students are interested in. We have a question about the bikes. Do the Google staff use these to get around? 2KM loved looking at the maps and we wish we could get these in Australia. Like AA said, the maps look like a fantastic way to learn! We were a bit disappointed that there isn't an Australia map, however, Olivia pointed out that other continents contain many different countries where Australia does not. She thought this might be the reason there is no Australia map. We're so glad you had a great time at Google, Mrs Yollis. We are all very envious of your visit and we thank you for sharing it with us! Thanks for your kind words and your outstanding comment! I loved the bronze dinosaur on the lawn. There doesn't seem to be much information about it. Not sure why. It was funny how people put the pink flamingos on it! The National Geographic maps are outstanding! They seem to be creating a map a year. The first one was Africa. Then they made Asia, and last year they made North America. This year they created a South America map, so I think they will make an Australia and Oceania map eventually. They also want to make one of the ocean floor! ANSWER: This group of Australian students are known for their incredible html skills. It is a fun show to watch and the questions (I mean answers) are very difficult. I am a big fan of the show so it was a real thrill to meet Alex. Wow! It sure looked like a fantastic experience at Google. I can't think of any teacher better suited for the experience. I appreciate the pictures you shared. It really looks like it is special place. I liked the Doughnut and Cupcake Sculptures most of all. Speaking of cupcakes, the ones at Alex Trebeck's birthday looked pretty tasty. Were they? I look forward to visiting you in September. I have used Google Earth many times to see places including my house. On my computer, I use a search engine called Google Chrome and it runs much faster than Internet Explorer or Mozilla Firefox. I hope you are having a great summer and I can't wait to see you in the fall. I can tell that you had an awesome time at Google Headquarters. It was great to be at Google this summer. Not only is it a busy place, it seems to be a fun place to work! I loved the delicious sculptures as well, and yes the birthday cupcakes were yummy. Say hi to Kendall and your parents, and I'll see you in September! How nice to hear from you, Ava! I am so glad that you have used Google Earth. We used it a little bit in class last year, but now I have a new segment that I am going to add to the blog using Google Earth! I think you will like it! What have you been doing with your summer? Going to near space I CAN'T BELIEVE YOU WENT TO GOOGLE. It had to be good, was it good? I wished to go to Google.It would b e cool wouldn't.I would just be dreaming being there until I finished this comment. From your blogging buddy Z♥e. Thanks for a great comment! Yes, I l♥ved being at Google! There was so much to learn and so much to see! I was the perfect place for me because I love to learn new things that I can then bring back to my classroom and share with everyone. Glad you are enjoying writing the html! i'm from kids in the mid, feel welcome to write a comment on my blog i'm happy to read. Hello! I am visiting your blog for the first time through the link at the Blogging Challenge blog. What a fantastic "Google" experience! And what an inspiring blog you have! Your students are very lucky to have you. I will be checking in on you again! I am so envious of your visit to the Google labs. Thanks for sharing so much of your visit with us. Thanks for joining the student blogging challenge beginning on 21st September 2010. I hope you enjoy the activities and try as many as you can. Remember to visit the other classes and students who are on two pages on the challenge blog. We are just beginning to use all of the amazing google things there are. Miss Cashen has made a Maths Map for us as it is Literacy and Numeracy week in Australia next week. It is all based around Bendigo, where we live. We get to zoom in on google maps and answer Maths questions about different parts of town. You can have a look at our map if you like. There is link on our blog called Maths Map. We are also going to write a story using Google docs. Miss Cashen has started the story and we can add to it during the week. She is going to share the story at assembly on Monday. We think it is exciting that you have been commenting on our blog and we can't wait to leave comments for your new school year. Miss Cashen told us that you are still on holidays at the moment. We would love to learn more about California. Thank you so much for visiting our blog! I checked out yours and left you a comment. The kids from LPS are sure great bloggers! Thanks for visiting! You will love being a part of the Blogging Challenge. Not only do you get to learn a lot about blogging, you meet many interesting people as well! I check out your blog. Thanks! Being at the Google Headquarters was an amazing experience for me. I hope I'll get a chance to go back someday...there is much to learn! We look forward to another great blogging challenge with you! We enjoyed the other two we entered and loved meeting all the other bloggers from around the world. Thanks for all the effort you put into the project! Wow! Excellent comment! Not only do you have a thoughtful comment filled with information, it is obvious to me that you proofread it before you published! Well done! I am going to try and include lots of Google projects on our blog this year as well. The map activity sounds fun. I will check yours out! Thanks for your interest in California. There is a link at the top of our blog with a little slide show about our state. What would you like to know? I will get my students answering your questions! I am Miriams sister. I am in 2nd grade, in Mrs Clebanoff's class.